The fi n-couplings DIN.AL., belonging to series “GEL- 500-S” are usually used for the connection of tachogenerators, encoders, contactors, motors, measuring instruments and for every application where a constant rotational movement in the four quadrants is required and where an absolute torque rigidity is required, even when the shafts coupling is not perfectly lined up. The particular dynamic construction with clamps in light alloy, allow the blocking of the coupling without using screws or keys. Patanted in Italy, Germany and France. The fi n-couplings DIN.AL., belonging to series “GEL- 100-S” are usually used for the connection of tachogenerators, encoders, contactors, motors, measuring instruments and for every application where a constant rotational movement in the four quadrants is required and where an absolute torque rigidity is required, even when the shafts coupling is not perfectly lined up. The particular dynamic construction with clamps in light alloy, allow the blocking of the coupling without using screws or keys. Patanted in Italy, Germany and France. Coupling obtained from two anodized aluminium hubs with special steel bellows. Unique misalignment correction capacity; high torque rigidity. Backlash and vibration free. Outstanding servo control. Screw fi xing system. Clamp fi xing system. Working temperature range: -30 °C ÷ +120 °C. Coupling obtained from two anodized aluminium hubs with special steel bellows. Unique misalignment correction capacity; high torque rigidity. Backlash and vibration free. Outstanding servo control. Clamp fi xing system. Working temperature range: -30 °C ÷ +120 °C. Electrically insulating. Vibration free. High speed permissible. High torque rigidity. Good misalignment correction. Working temperature range: -10 °C ÷ +80 °C. Highly cost-effective coupling built using die-casting technique. Metal parts fi tted into hubs allow for optimal shaft connection. Thermally and electrically insulating. Working temperature range: -10 °C ÷ +80 °C. Suited to countless applications. Vibration free. Good misalignment correction; low spring torque rigidity. Extremely sturdy model. Working temperature range: -30 °C ÷ +120 °C. Couplings obtained from one piece of material. Suited to countless applications. Backlash, vibration and maintenance free. Unique misalignment correction; high torque rigidity. Working temperature range: -30 °C ÷ +150 °C. Couplings obtained from one piece of material. Clamp fi xing system. Suited to countless applications. Backlash, vibration and maintenance free. Unique misalignment correction; high torque rigidity. Working temperature range: -30 °C ÷ +150 °C. Obtained from two aluminium hubs and one central rubber part damping vibration and correcting misalignment; reduced noise. High torque transmission despite their compact size. 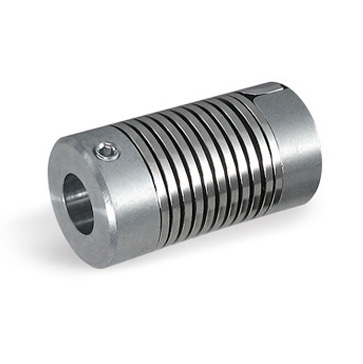 Both coupling versions are suitable in stainless steel. Working temperature range: -30 °C ÷ +80 °C. Unique radial, lateral and angular misalignment correction. Thermally and electrically insulating. Maintenance free. Working temperature range: -30 °C ÷ +80 °C. High resistance to petrol, oil, benzene, hydrocarbons, alcohol, solvents and many other chemicals. Also available in screw and key versions. Clamp collar suitable for countless applications. Available also the version in stainless steel on demand. The couplings of the UNIMATIC series are made of forged steel. The two hubs are fi xed to the disc pack - which is made of spring steel - by means of heavy-duty screws. They allow absolute precision. The couplings of the UNIQUADRA series are made of forged steel. The two hubs are fi xed to the disc pack - which is made of spring steel - by means of heavy-duty screws. They allow absolute precision. While sharing nearly all the technical specifi cations of the basic series, the MULTIMATIC series allows the user to correct any additional misalignments. A multiple disc pack allows this particular coupling to be fi tted in for special application. While sharing nearly all the technical specifi cations of the basic series, the MULTIQUADRA series allows the user to correct any additional misalignments. A multiple disc pack allows this particular coupling to be fi tted in for special applications. The SPECIALMATIC series has been developed for the jobs where the transmission capacity requires signifi - cant distances. This series makes it possible to supply - on request - spacers and shafts up to six metres in length. The couplings of the SPECIALMATIC series can be supplied with customizable balancing and treatment.